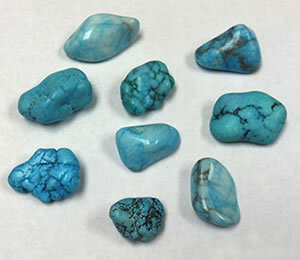 Howlite nuggets and tumbled stones that have been dyed a turquoise color. They look like turquoise - but they are not. If you have looked at inexpensive gemstone beads, cabochons, and tumbled stones, your eye has probably been drawn to a sky-blue material with a semi-gloss polish that looks exactly like turquoise. Many pieces even have the gray to black veining often seen in genuine turquoise specimens from the Bisbee and Sleeping Beauty mines. This material probably isn't turquoise. Most likely it is one of two other minerals, howlite or magnesite, that have been skillfully dyed to colors so similar to turquoise that it fools almost everyone (at least the first time they see it). The gray to black veining aids in the deception. Take a look at the tumbled stones and dyed nuggets in the photo. They look like turquoise but they are really dyed howlite. Now you know to be skeptical when you see a nice blue stone that looks like turquoise. Howlite is a calcium borosilicate hydroxide mineral that is found in some evaporite deposits. It usually occurs within layers of gypsum as irregularly-shaped nodules that resemble small heads of cauliflower. These nodules are usually white in color with gray to black veins. They often resemble turquoise - but with a white color. Although not visible to the eye, howlite is a very porous mineral. This porosity enables it to be penetrated by dyes and stained a variety of colors. 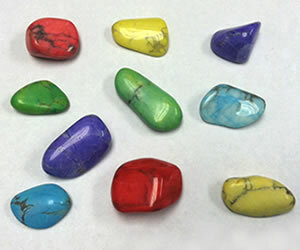 Howlite and magnesite dyed a variety of colors: blue, yellow, red, green and purple. Dyed howlite and magnesite are a common find in tumbled stone mixtures. It kicks up the color of the mix and increases sales. Magnesite is a magnesium carbonate mineral with a chemical composition of MgCO3. It forms when magnesium-rich rocks or carbonate rocks are altered by metamorphism or chemical weathering. Some specimens are crystalline and transparent and show obvious cleavage. Other specimens are cryptocrystalline and have a white milky appearance. These milky specimens are the ones used to make tumbled stones, cabochons and beads. Like howlite, this milky magnesite is porous and readily accepts dye. Howlite and magnesite are completely different chemically, but they are both soft, porous, white materials that readily accept dye and can be cut and polished to a bright luster. They are much softer than agate, jasper and other typical gemstone materials. This lower hardness enables them to be shaped and polished with minimal labor, abrasives and electricity. The rough material is also very inexpensive. All of these cost savings make them some of the least expensive materials that can be used to make gemstone beads, cabochons and tumbled stones. If white howlite or magnesite are offered for sale as tumbled stones, beads or cabochons, they receive very little attention in the marketplace. Most people think that they are boring. However, when they are dyed to a brilliant or pastel blue, green, red, yellow or purple they really catch people's eyes. Although the bright and pastel colors of dyed howlite and magnesite are not typical of gem materials (and experienced eyes detect the phony color immediately - they consider them to be "outrageous!"). These dyed stones are exceptionally popular and sell quickly. The combined appeal of bright color and low price are attractive to many customers. Dye is what gives them their appeal.